This last picture of Levitan was painted in 1895. “Lake Rus” – the main work of the painter of the later period. The artist has not completed this creation, as he died. But even in this unfinished form, the picture makes a huge impression on all viewers. Sunny day, its incredible freshness and special brightness, transmitted with special spontaneity, which is almost impressionistic. The viewer sees magnificent golden clouds floating across the sky, bizarrely reflected in the lake. On the shore you can see the belfry of bright white, lush green meadows, autumn trees. All this fills us with the belief that a very joyful and necessarily good future awaits Russia. 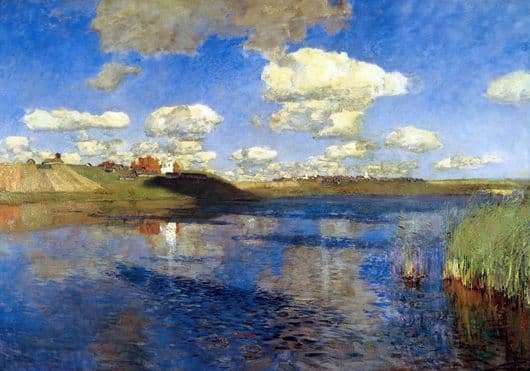 Painting Levitan – a synthesis of all the observations and impressions of the artist on the nature of their land. The artist worked on this canvas for an incredibly long time and, above all, with inspiration. For him, he made many sketches and sketches. Very often he traveled to lakes in the Tver province, which became the kind of his masterpiece. Levitan skillfully combines the rich colors of summer with a riot of shades of autumn nature. The artist’s intention is that this is exactly what nature should be like in rather rare moments of its true happiness. Before the viewer appears incredibly romantic picture, which sounds like a lyrical song. It is important that the sky is not just the background of the picture. There is an overwhelming feeling that the clouds do not just float and catch up with each other, but seem to go beyond the canvas. It is the clouds – the most expressive part of this grand landscape. The space is covered so large that a truly panorama is created. Clouds move, increasing this incredible breadth. All colors of the paintings are unusually bright and clean. Clouds are far from just white. They are slightly purple and slightly yellowish where the sun’s rays illuminate them. The entire canvas is created by strokes of great width, which summarize all the objects. The painter tries to combine some decorative and genuine monumentality; the complexity and generalization depicted by him, psychologism and the subtlety of the transitions between color and light.